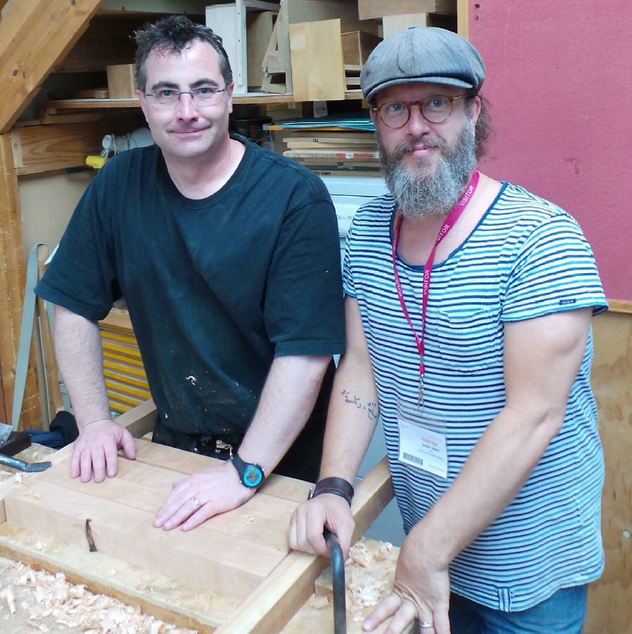 This week I'm at Warwickshire College building a sawyers bench with hand tool woodworking expert Tom Fidgen of the Unplugged Woodshop and An Unplugged Life. The training course, organised by New English Workshop, is one of several going on this summer with some of the most famous woodworking instructors in the world, including Roy Underhill, Christopher Schwarz, Peter Follansbee and Yannick Chastang. We started with boards of rough sawn cherry, fairly unpromising to look at in this condition, but trust me, there's some seriously gorgeous fruitwood hiding under that rough exterior. The first job was setting out a cutting list and Tom took us through the process of adapting the design to suit both the timber and our own personal preferences for the project. One of the things I love most about hand tool woodworking is that it is working with the wood, rather than trying to impose your will upon it, as we tend to when emboldened by the power of electric tools. It was nice to get Tom's take on this and learn some of the clever techniques that he uses to save time and effort. The stock was then dressed and roughly dimensioned by hand. For the cleaning up I've been using a Mujingfang jack plane, the tough HSS blade makes it a great choice for preparatory work like this. I've done at least 20 square feet so far and only needed to hone the blade once. The blade has been honed with a relatively slight camber and then I've whacked on a load of lateral adjustment so that a corner of the blade bites really deep. This slices up the waste nice and quickly and with relatively little effort, kinda like a scrub plane but less aggressive. With a couple of quick taps you can easily switch sides or square the blade up to take a few levelling strokes and see how you're doing. It doesn't take long to figure out that keeping it as ugly as possible for as long as possible is the fastest way to get down to a nice level surface. Once the Muji had exposed clean wood and sliced off the worst of the bumps, I switched to a Clifton No.6 to true up the surfaces.We are not aiming for set numerical dimensions here, it is a sawbench after all. If you can get away with producing evenly matched, four squared blanks, it's a lot easier to adapt the joinery than do unnecessary extra planing to thickness. I tend to face and edge the convex side of a small batch of boards, then go back and true up all the concave faces. It would probably be better practice to finish each component completely before moving on to the next, but I find this breaks up the work a bit and helps me to stay very aware of time and progress through the day. If you are all done facing and edging before you're halfway through your time, there may be a chance to fit something else in before end of play. If you're past halfway, you get as much warning as possible that you need to ease your workrate up a notch. In either case, it is important to at least open up both sides of the board by the end of the day so that they lose moisture evenly and remain flat and straight overnight. The little low spot next to my thumb in the photo above is a perfect example of a job for the smoothing plane. The rest of the board is flat and is the same thickness as the matching board. Because this is part of a non-show, non-working surface that won't form part of a joint, I'll be able to sort out out that rough spot with a short soled smoothing plane. The smoother will follow the slight concavity rather than bridging it as the fore plane does, which saves having to plane the rest of both boards down to the same level. I've left it rough for now so that I remember not to square off that part when jointing the edge. So there we have it, end of day two with almost all of the stock dressed and settling, hopefully tomorrow we can get into orientating the timber and laying out some joinery. Tom showed us a neat little technique for minimising blowout on the exit side of a saw cut, so I'm looking forward to practicing that again. It's such a luxury to spend a whole week at the bench, especially in such esteemed company and in the beautifully equipped and lovingly maintained workshops of Warwickshire College. This is a first rate facility, kitted out in the 1960's with a lathe room, a fully equipped industrial machine shop and an eighteen bench hand tool workshop. Right, must get to bed - early start in the morning!